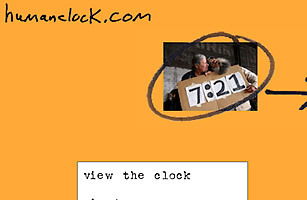 Click here to see what time it is. With each passing minute, you get a new image  ranging from shots of a person (or group of people) holding up a sign ("4:17") to inanimate objects arranged or labeled to convey the relevant information (license plates, household address shingles). You can keep things going in a smaller window on your desktop by clicking "gimme a cute window." Visitors are strongly encouraged to submit a photo  provided they follow the do's and don'ts, as in, please don't submit pictures of license plates, they have too many already.